I hope this chilly weather finds you well! We are so excited to announce our next class - Pamper & Press Tropicana! We are changing things up a little and letting you come in and choose the layer cake you would like to use for class! 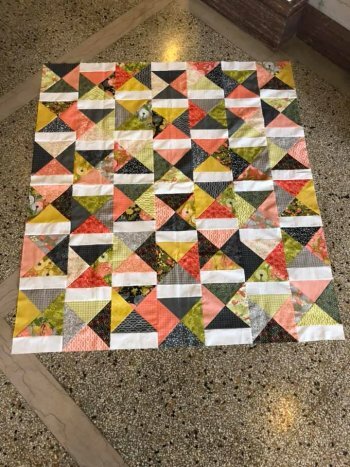 Project size: 61" x 68"
The options are endless with this fun project - grab some masculine fabric and make it for him, bright flowers for a picnic quilt, or even add borders to make a cozy couch quilt! For those who may be new to pamper & press classes - we cut everything beforehand for you and then press for you along the way! You get to enjoy the day sewing and should end up close to finished when the day is through!